Finally! It seems my prayers have been answered by the Taylor guitar builders! An affordable acoustic guitar with nylon sides, no visual or technical bells and whistles, but with sophisticated gadgets, such as armrest and a short finger-compatible nut width with the focus on: "Sound". The workmanship outside is first class, but inside unfortunately only well .... Maybe I'm a little strict here, but swollen glue residue inside the body would not be unconditional. The guitar also smells of wood glue at the beginning. This flies but after a few days. The sound is wonderfully clear. No comparison to my previous acoustic guitars, which were also located in the lower price segment. My personal highlight is the saddle width. At 50mm and 52mm I have my dear problems to achieve a reasonably reasonable barree. With this guitar - no problem. The minimalist design draws the eye to the armrest, which makes the guitar a special eye-catcher. This not only looks great, but also ensures that the guitar can be played very pleasant. Conclusion: some everyday guitar that is really fun! Taylor of the poor, but a nice sound and a very good handle. - Small and light guitar. - Ebony fingerboard and bridge. - Perfect handle for me: 48mm wide, flat C profile, with truss rod. - Nice stamp (but not that of a classical guitar). Its quite powerful. - Moche: coarse varnish, no binding. - Truss rod adjustment key not supplied. - The "ergonomic" chamfer on the splint is a gadget that is useless if the player is an adult. 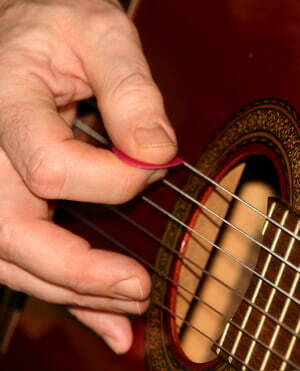 - Ropes a little too high, to adjust therefore by acting on the nut and / or truss rod. I recommend this guitar to fingerpicking players who want to expand their sound palette. I do not recommend it to play the classic. For other styles: bossa, jazz, flamenco, etc., I will not pronounce. ID: 406432 © 1996–2019 Thomann GmbH Thomann loves you, because you rock!